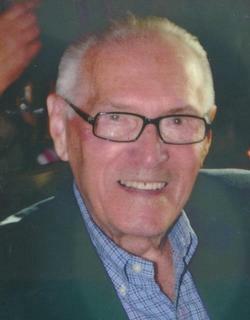 Morris Ruchin, 99, passed away on August 24, 2016 after a lengthy illness. He was born to Joseph and Minnie Ruchin on July 6, 1917 in Hartford, Connecticut. He was married to Gertrude (Schwartz) Ruchin for 63-years. Gertrude Ruchin preceded him in death in 2004. He went through public schools, including graduating from Weaver High School. He also attended Hillier College in Hartford, Ct. Morris and Gertrude were very active for many years with the Jewish War Veterans, Morris having served as Connecticut State Commander. He is mourned by his two Sons, Earl Ruchin and Wife Sandy of Dracut, MA and Garth Ruchin and wife Susan of Anthem, Arizona. Also surviving are his three grandsons, Todd Ruchin of Darrington, WA, Matthew Ruchin and Narissa of West Hollywood, CA, and Scott Ruchin, of Enfield, CT. He leaves many beloved nieces and nephews. Additionally, he leaves his beloved Selma Meadows with whom he lovingly shared the last 11-years of his life, and her wonderful family. During World War II, he served in the U.S. Army Special Services with “The Berlin Bounders” a traveling variety show for the troops in the fields of battle in several European countries. He served in the active military simultaneously with his three brothers. Right after the war he worked actively in live radio shows including plays and news broadcasts. He participated in many live play performances in the Hartford area. Looking for a consistent income, he began as a salesman selling furniture, an industry he worked until his retirement in 1987. In 1989, Morris and wife Gertrude moved to Boca Raton, Florida where he resided until his passing. A Memorial Service will be held on October 16, 2016, 1:00 P.M. at The Gardens, 4103 North Military Trail, Boca Raton, FL 33431.